After making their indelible marks on the game, luminaries KRS-One and Buckshot, arguably two of the games most prolific emcees, will link up to give fans a collaborative album entitled Survival Skills. Guest features include Mary J Blige, Talib Kweli, Bounty Killer, Pharoahe Monch, K'NAAN, Immortal Technique, Slug of Atmosphere, Melonie Fiona, Sean Price, Rock of Heltah Skeltah, Smif N Wessun, DJ Revolution, and Naledge of Kidz in the Hall. ÿProduction features include Havoc of Mobb Deep, 9th Wonder, Black Milk, Nottz, Ill Mind, Marco Polo, Khrysis!, Coptic, Moss, DJ Mentplus. Still gritty tracks like "Clean Up," featuring Rock of Heltah Skeltah and the politically minded "Running Away" featuring Immortal Technique, make Survival Skills a Hip-Hop fan's dream, catering to those that love lyrics and the boom-bap. Equally as rich is the album's Black Milk-produced track, "The Way I Live" featuring the Queen of hip-hop soul, Mary J. Blige. Together they create a triumphant anthem for all those on the grind trying to conquer their dreams. 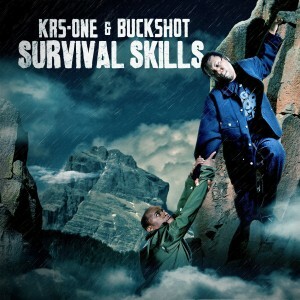 What KRS-One and Buckshot have created is an album that is socially responsible, lyrically sharp and sonically banging.